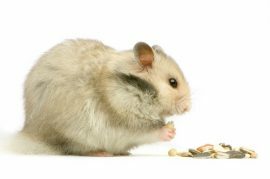 While some pet owners don’t necessarily go out of their way to get treats to their hamster or gerbil, there are options besides expensive store-bought brands, which can be pretty unhealthy. It turns out making treats for small rodent friends is actually pretty easy, taking only a few steps and a few ingredients, such as the always reliable raw honey rather than tons of sugar. If you need a few good treats for your hamster, gerbil, guinea pig, or rabbit, let’s get started on this simple Manuka honey recipe! To begin your preparations, start by first peeling the carrot before chopping it and placing it into a blender to puree. The next step is taking your half a banana and mashing it up with a fork. With that done, mix the banana and carrot together before adding the raw honey to it, combining the ingredients until well blended. Whether you use oats or Cheerios for this next step, take them and crush them into a powder, possibly via a food processor, a blender, or a hammer and bag. Repeat whichever process you choose with the hamster/gerbil pellets. Mix these ingredients in with the rest in a sizably large bowl, adding in a little water or raw honey if the end product is too dry. With your mixture ready, heat your oven up to 300 degrees Fahrenheit on the Bake setting before lining a baking sheet with some tin foil. After the sheet is ready, you can either roll your dough into small balls or slice them using a cookie cutter before laying them out on the foil. Set the baking sheet full of treats in your oven for about 30 minutes, allowing them to cool on wax paper or a wire rack afterward. From there, you can serve these treats to your hamster, gerbil, or other small furry friend as much as you deem to be enough. Just remember that if you’re making these treats for guinea pigs or rabbits, you may have to modify your baking choices. Specifically, these animals cannot eat Cheerios, so use the oats instead. Need to order some raw honey to make these treats? Click here to get your order started and remember, we offer FREE shipping on all orders of $150 or more.